There are few things I love more than having an awesome manicure - my #planneraddiction is probably one, and so is coffee. If I had a million dollars my nails would be on point every day (no pun intended). I've been drawing a lot of inspiration from Jefree Star ever since I started following him on Snapchat recently. I've always had a thing for those stiletto nails and even started wearing my nails in a really severe almond shape. I've been wearing some press on/glue on nails from the drug store for probably about a year now. Last week my manicure was a set of French tip nails from Kiss and I couldn't recommend those enough! This week I thought I'd try something new - a little bit of bling and little bit of a stiletto. I've done this mini stiletto nail before (not sure if I'd ever showed it on any social media) but these nails make for the perfect base. And the best part is they are super affordable from your local drug store. I suggest checking out CVS and using your Extra Bucks for some awesome discounts. They are called Active Oval, but they are more almond to me. And that shape is perfect for filing into a tiny, mini stiletto point. I could not function if I had a full stiletto nail - I would not be able to type at all - so the little mini point is cute and interesting. This shape, I think, is great for long fingers - especially if you want to emphasize the length. It might be weird but I love how alien they kind of look!! Begin by picking out the nails to best suit your fingers. 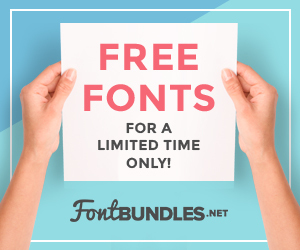 There is a trick to this - you don't want them too wide and you don't want them too narrow. Once you find a nail that fits your finger, find the size smaller and see how that looks. If the first one looks better choose that one - but I often see others with glue on nails like these where the nail is way too wide for their finger. The more natural the nail looks the better. You may find you have to file down around the edges to make the nail fit your nail bed better. Take the time to do this step! This is especially necessary if you find you've run out of the nail size that fits a certain finger best. This step will ensure that you have the best fitting and most natural looking nails glued one. If you're a pro at applying glue on nails, go ahead and do your normal routine. I use a file to scuff up my natural nail a bit so the glue will adhere better. Lay all the nails out in the order they will be applied and begin to apply them one by one. 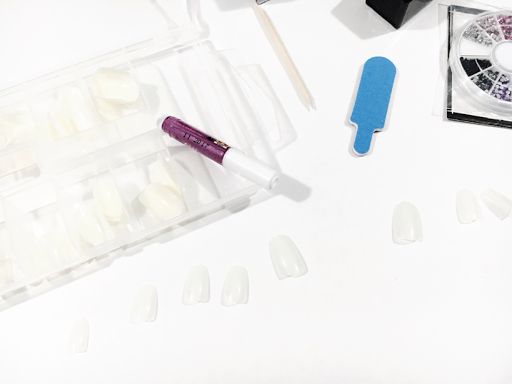 I start with my thumbnail on my left hand - I apply glue to the back of the nail then place the nail on to the nail bed starting at the cuticl and sort of rocking it down. For me, this give the best adhesion. Continue until all nails are on your little fingers. Begin to shape the nail into a mini point with the file. Follow the natural angle of each side of your finger to create a nice point. Shape all the nails into a mini stiletto. 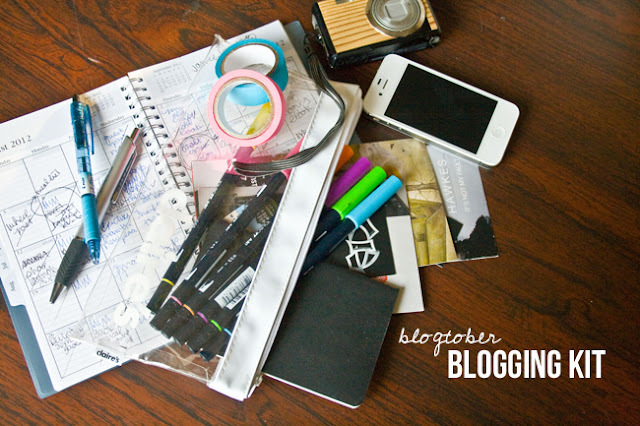 Do not file too much at once but alternate the filing from side to side to get an even point. Paint your base coat. 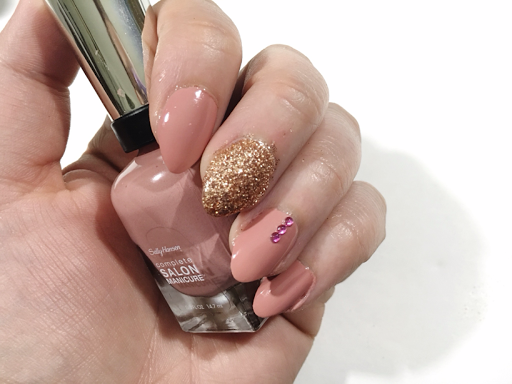 Choose the nails that will be covered with glitter, paint every nail except for the ones covered with glitter in the polish color of your choice. Choose the nails that will remain rhinestone free, paint the top coat on all nails that will remain rhinestone free. Make sure you have a place to make a mess with the glitter! Paint the top coat, one nail at a time, on the nails that will have glitter. Pour the glitter over the nail, tap off the excess. 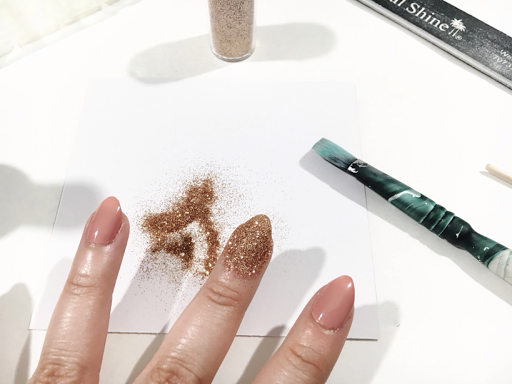 Use the remaining glitter to repeate the process on each glitter nail. If you find you may need to add more glitter, pain the top coat again, pour the glitter again, etc. If the glitter gets everywhere - which it probably will - use a paint brush to dust off the glitter around your cuticle. One you are satisfied, paint the final top coat over the nails. This one may be a little tricky. 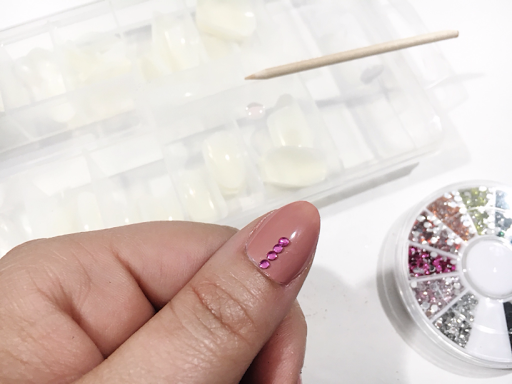 Squeeze out a little bit of glue onto your plate, using the toothpick dip it into the glue then pick up a rhinestone with the glue end of the toothpick and place it on the nail. Fill the whole nail or do a strip down the middle - it is up to you. Repeat with however many nails and whatever design you prefer. Once everything is done, if you haven't already, go a ahead a spray the quick dry spray onto your nails. Now you have a crazy glitzy mini stiletto manicure! It might be crazy but it's definately worth it! What is the craziest manicure you've ever had? Do you find it super fun to play with your nails? 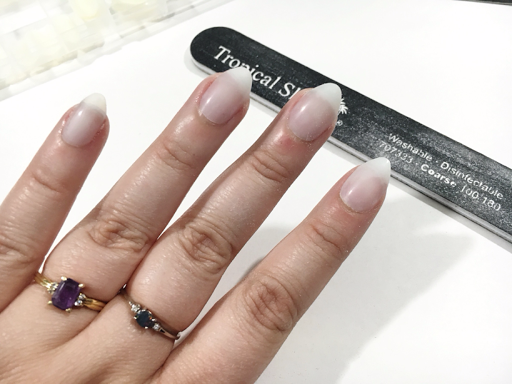 The nail design usually requires a pricey trip to the salon to achieve, but you can copy it at home for much less time and money. Thanks for the tute!